Sooooo, more granola from me. If you’ve been following for a while, you know that I have a bit of an obsession with granola. Kind of like muffins I suppose! Although that’s just how fickle I am when it comes to food. I was just going on and on about how I never want to post anything but muffins anymore, and now I’m going to be saying pretty much the same thing about granola. Obviously. I already have other recipes for it here, here and here. Oh and here. Yup, those are all different versions. 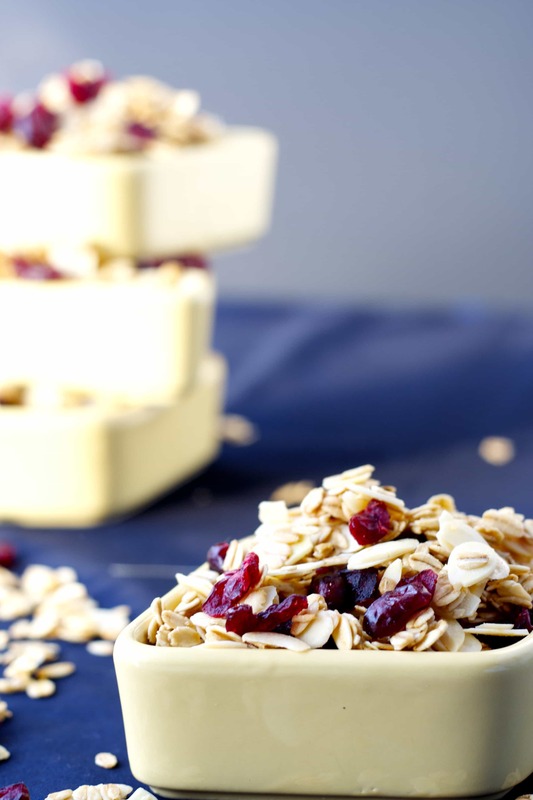 And so is this cranberry, almond and orange granola that I have for you today. Can we say obsessed? There’s a reason for it though. It’s such a healthy and filling breakfast, and I get bored if I make the same thing every time. So don’t expect me to stop with the endless granola recipes any time soon. Can’t do it. And, this one is extra healthy since I stopped myself from adding chocolate. I did consider it, don’t get me wrong, and if you wanted to I certainly wouldn’t stop you! Chocolate is always a good idea in my opinion. But I wanted this version to be nice and healthy, and not overly sweet. Trying to get back into healthy eating habits and all that after the holidays! This granola is helping me. Because a smoothie for breakfast just doesn’t cut it for me. I like to actually eat something. And this granola, paired with some plain Greek yogurt gets me through the morning without a problem. And I’m not even starving by lunch. Which definitely helps with the whole trying to eat well plan! 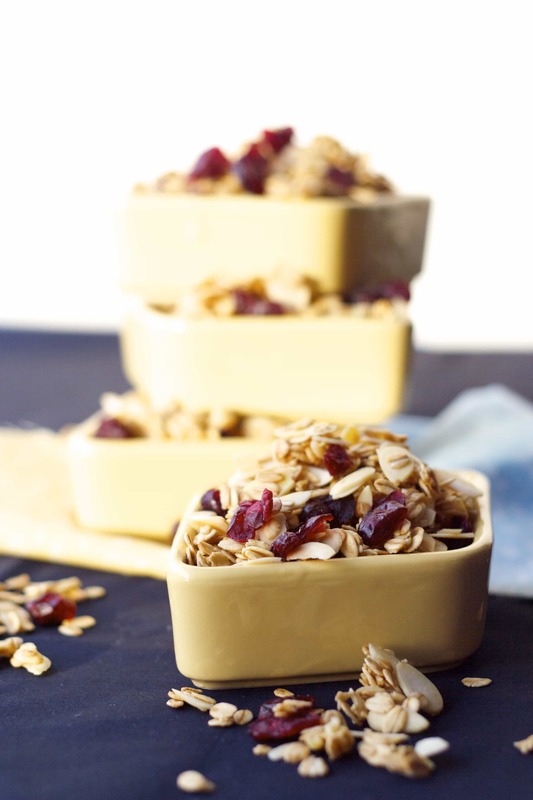 This granola is lightly sweetened with a bit of brown sugar and maple syrup. If you prefer your granola on the sweeter side, you could definitely double the brown sugar, or add another tablespoon of maple syrup. I wanted a barely sweet granola this time, so I used enough sugar to sweeten it a little and enough coconut oil to give it the crunch that granola obviously needs. But there’s not so much there that it forms super sweet clumps of granola. Although I’m not against that, not even close, just not what I was going for here! This cranberry, almond and orange granola is definitely the healthiest of all the granola recipes I’ve posted, which is saying something, as I think all of them are pretty healthy, especially when compared with the commercial kind! It’s also lightly flavoured with orange, from the zest and juice of an orange, which is complemented perfectly by the cranberries and almonds. We loved this granola. So if you’re looking for a healthy breakfast that takes just minutes to mix together, try this out. It’s the perfect start to your morning! Preheat the oven to 250 degrees F. Combine the brown sugar, oats, almonds and orange zest in a large bowl. In another bowl or measuring cup, combine the orange juice, coconut oil, maple syrup, salt, and vanilla. Pour the liquid into the oat mixture while stirring to combine. Mix until the liquid is evenly distributed. Divide the mixture between two 11x17 inch baking sheets, spreading it out so that it's even. Bake for 1 hour and 15 minutes. I usually swap the baking sheets halfway through the baking time. Remove from the oven and allow to cool completely. Stir in the dried cranberries. Transfer to a large airtight container. It will keep well in an airtight container at room temperature for 7-10 days. Yum! I can understand why you love your granola so much, it looks soo good and the fact that it's good for you is even better :-) Keep the granola recipes coming!! 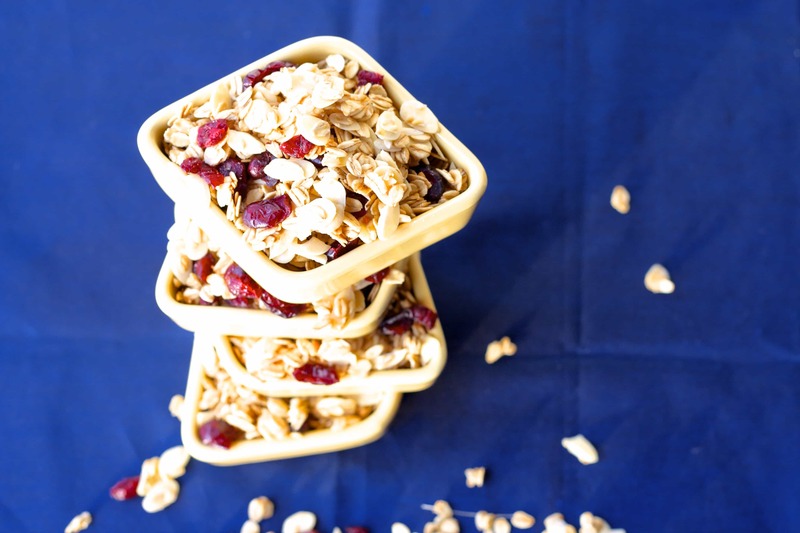 There is definitely so much opportunity for variety with granola, and it's pretty darn healthy, and it's portable! I always need snacks for on-the-go. This looks delish! I love the cran, orange, and almond combo! Stay warm up there, girl! Thanks Sarah! Not so warm this week, but next week is supposed to be a bit better! I'm envying your warm sunny weather right now just a little! Such a yummy breakfast! This sounds lovely! Thanks Katrina! Granola is maybe my favourite breakfast - I think it's the endless flavours! mmmm! 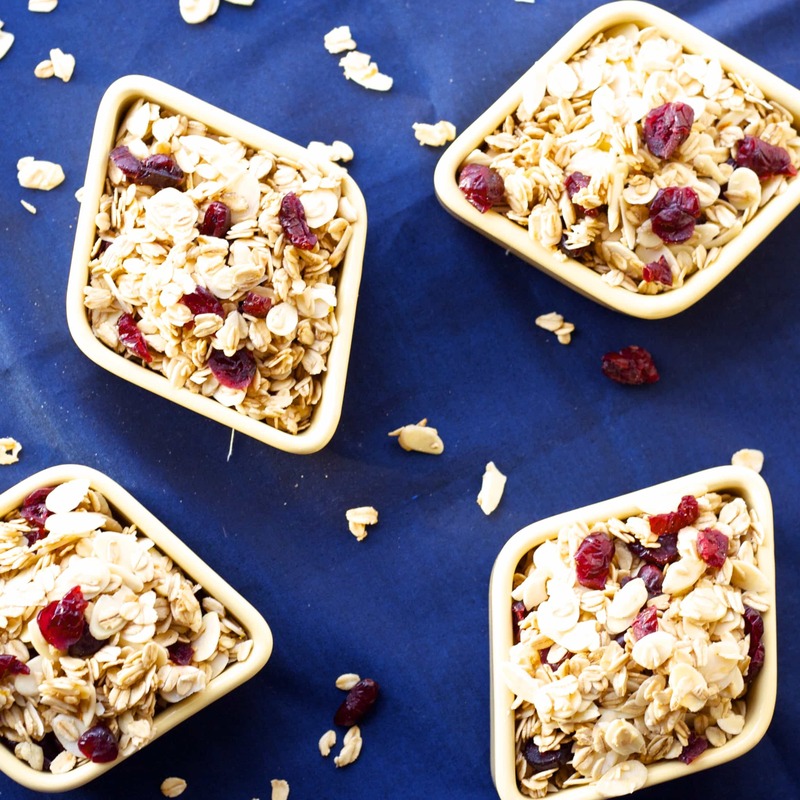 Rolled Oats, almonds, cranberries, coconut oil ... check, check, check, check .... got 'em all in the pantry! This recipe sounds deliciously awesome, and I've been wanting to make up a granola for awhile now. Thanks, Stacey! I'll look forward to your newest granola recipe, Stacey! This one is just as tasty as it looks in your photos, and I'm going through the batch pretty quickly all on my own. Thanks Dannii! I totally use dried cranberries all year. They're so good in so many things! I do sometimes! Thanks Sarah! Wow - this looks wonderful! I've never made granola before but I definitely need to try this! Oh you definitely need to try making it if you never have - so much better than the commercial kind! And you can put in whatever you want! Thanks Jim! I was just looking for a new granola recipe and this one looks perfect! Love cranberries and almonds! Pinned! Yay for homemade granola! I'm obsessed with it too so I say keep the flavors coming! Cranberries and almonds and cranberries are a match made in heaven! Yum!! Looks awesome Stacey! and I have an obsession with granola as well! There are just way too many flavors and it's difficult to stop making them! Pinned. Sooooooo many flavours right?! Thanks Manali! And thanks for pinning! I have an obsession with granola as well! It's just so darn good and addicting! I love your version with cranberries and almonds! Looks amazing.